Today I wanted to show you the exact steps I would take to find the best keywords to include on a webpage. This technique can be used for ANY niche. It’s a fact that you have a far better chance of receiving traffic for a keyword phrase if you actually have that phrase within the content of your webpage. If you want to rank for specific keyword phrases in Google, those keyword phrases need to be present on your webpage. For the purpose of this blog post I am going to use the keword ‘dog training’. Backlinks aside, I would need to create a webpage that contains ‘relevant’ keywords that are related to ‘dog training’. What I would do here is perform a search in Google for the term ‘dog training’. I would then pick out ALL the keywords including long tailed keywords from the top 5 rankings pages. This can be time consuming and often difficult to do accurately so I use a new software application of mine called ‘URLXtractor’. 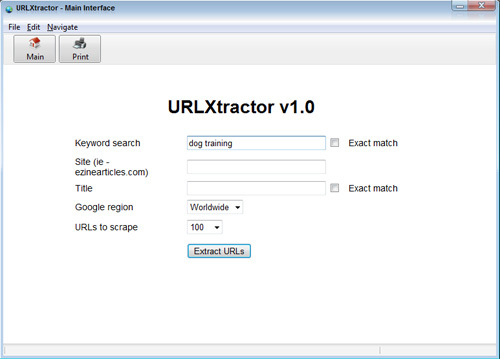 URLXtractor is a neat peice of software that can scrape URLs from Googles search results, scrape VAST amounts of keywords, emails, check PR etc. For this tutorial I’m going to use it to extract keywords from the top 5 web pages. 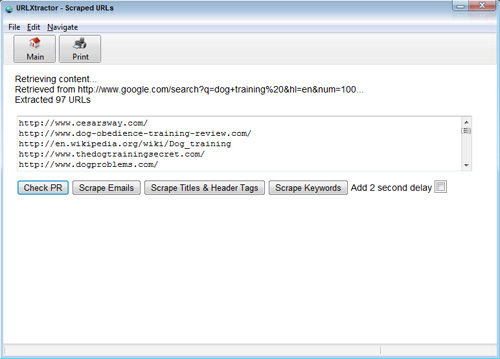 STEP 1: Load the software and enter the keyword ‘dog training’ into the keyword field and click the ‘Extract URLs’ button. Step 2: Delete ALL the URLs apart from the top 5 and then click the ‘Scrape Keywords’ button. 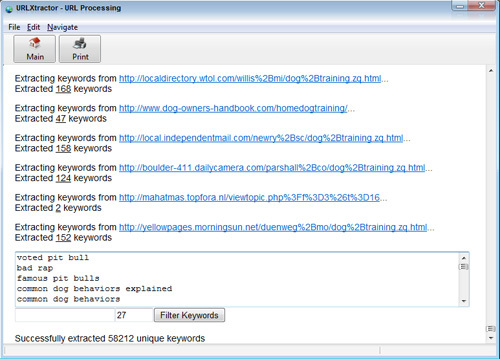 Step 3: The example below shows 857 keywords extracted from those top 5 rankings webpages. What we need to do now is filter this list. 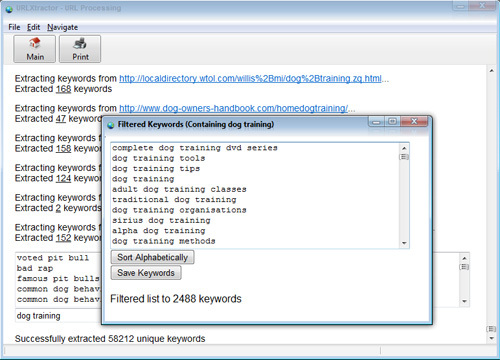 If I want to obtain all the keywords that contain my chosen keyword ‘dog training’, I would then enter that into the text field as shown below and click the ‘Filter Keywords’ button. 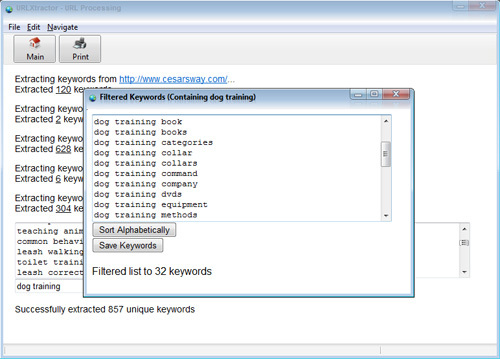 Step 4: What we are left with now is a list of 32 keywords that contain the keyword ‘dog training’. These keywords are ALL present and visible on the top 5 rankings webpages. You can then choose to sort this keyword list alphabetically or SAVE them to your hard drive. Some of these keywords are the ones that you would need to build content around and add to your webpage. Backlinks aside, Google has ranked those webpages at the top of their search results because of their content. This of course includes the keywords that are contained within that content. 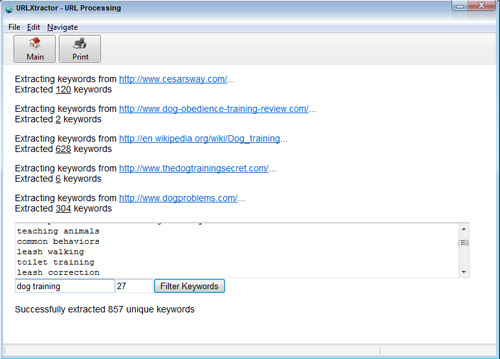 You can also then alter the filtering, for example just filter the list using the keyword ‘dog’. This will then display ALL the keywords that contain the word ‘dog’ but not neccessarily the word ‘training’. You can also reverse this and filter the list using ‘training’. The possibilities are endless but this software gives you the power to find these keywords and also filter them down into manageable and highly useable lists. The real power of URLXtractors keyword scraping feature is the ability to AUTOMATICALLY scrape ALL the keywords from upto 1,000 URLs / webpages. This is an absurd number of relevant keywords, and all of them were present on webpages ranked in Google. When creating any webpage you need to create a theme. This is what Google uses to match up a webpage to a ‘search query’. The best way to do this is to reverse this way of thinking and look at the webpages that Google ranks most highly for any specific keyword phrase. You can download and use URLXtractor along with 9 other cool applications for 7 whole days for just $1. If you love my applications and would like to carry on using them (along with all my other forthcoming apps and article networks) then you can choose to stay subscribed for only $17 per month. There are no large up front purchases… just the one small monthly fee. If you don’t like what I offer then you can cancel your subscription directly from within your Paypal account within the 7 days. I was offering a FREE trial but had to remove that due to problems with Paypal transferring data to my server. So, it had to be a $1 trial. Apologies for that! You can gain access to all my software applications here.. The private forum will be up and running shorltly also, which will be accessible to my paid subscribers only. Great stuff Andy, I always take lot of notice on your articles and your valued advice.